The global oil and gas industry is required capital that is in acceptable cost. However, due to some forces such as remote offshore operating conditions, uncertain reserve, high risks and increase of competition between companies has driven high investment and operating cost. So that oil and gas companies need more capital to develop project and longer periods to build new production facility. Therefore, financing, investment and profitability are important concerns of management in oil and gas company. 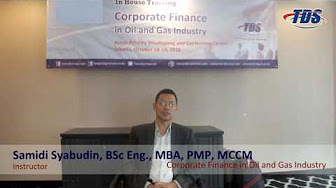 This training will provide a mix of theory and practice with the aim of equipping participants with a solid grounding in the core concepts of Corporate Finance in Oil and Gas Industry. Corporate Finance in Oil and Gas Industry covers Company Investment, Financing and Dividend principles. It will also analyse the tools needed to make appropriate financial decisions. Participants will be encouraged to select a corporate firm of their choice and use its financial statements for all the exercise activities designed in this training. The aim of this module is to provide participants with both the theoretical underpinning and the analytical skills required to effectively evaluate corporate financial management decisions in Oil & Gas Industry; to enhance understanding in financing, investment and dividend principles; to apply the financial analysis tools; to apply the discount rate of project investment; to be able to calculate cost of capital from debt and equity; to familiar with oil and gas company profit and dividend options. carry out a comprehensive risk profile of a company. calculate firm's weighted average cost of capital and to evaluate its capital structure. recognize the factors behind firm's value. evaluate firm's capital investment decisions. The Dividend in Oil and Gas Industry - Profit characteristics & Dividend Calculation. Dividend Policy and alternative options. "Corporate Finance in Oil and Gas Industry" belum kami jadwal, silahkan hubungi Training Service kami untuk jadwal atau in house training.